Figure 1. DNA basic parts domestication. Third construction refers to CDS GB domestication. Part BBa_K2656013 is the superfolder Green Fluorescent Protein coding sequence BBa_I746916 compatible with both Biobrick and Golden Braid 3.0 assembly methods. 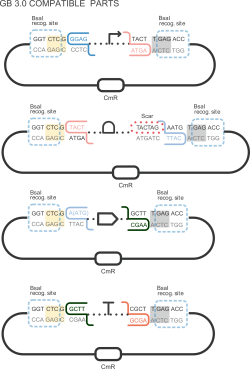 It can be combined with other compatible parts from our Valencia UPV IGEM 2018 Printeria Collection to assemble transcriptional units in a one-step BsaI reaction with the Golden Gate assembly protocol .